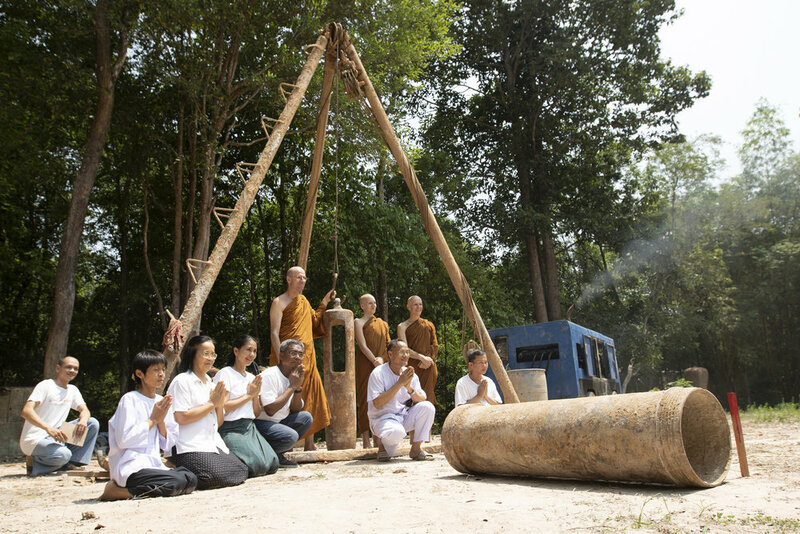 The process of constructing the new ordination hall (“Bot” , “Uposatha”- or “Sima”-Hall) of Wat Pah Nanachat started with a team of workers casting the foundation pillars on the site of the Visunggama-Sima during over a period of tabout ten days at the end of April and beginning of May 2019/2562. The tradition of pouring water over the hands of senior monks and elder people on Songkran day (Thai new year) is a beautiful gesture of respect maintained in the northeastern culture. 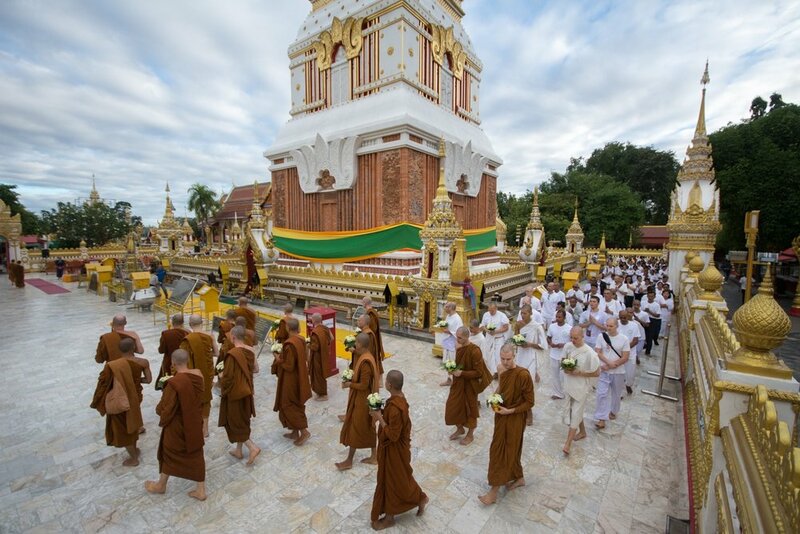 On April 12, 2019 the Sangha of Wat Pah Nanachat went over to pay hommage to Luang Por Liem at Wat Nong Pah Pong, who received a stream of water over his hands coming down from two wooden naga-sculptures that cannel the water the disciples offer. In Wat Pah Nanachat the laypeople provide a full shower to the monks, novices and pakaos. With great joy they pour water from outside into the shielded-off bathing area, where the male disciples soap and rinse the Sangha. 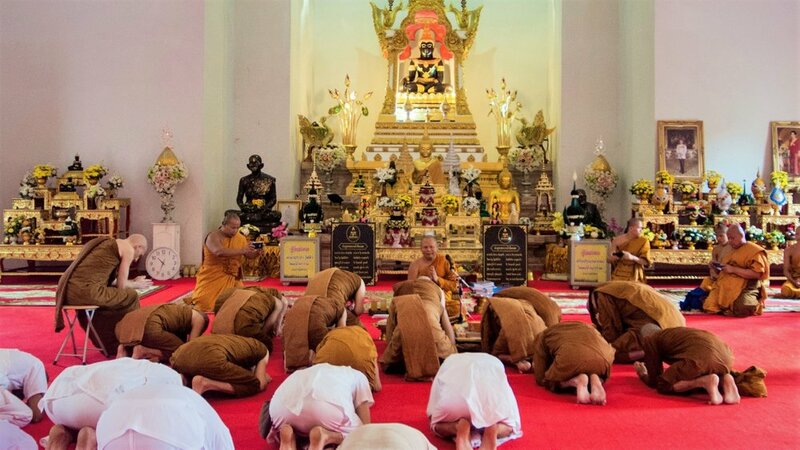 In the main Sala the monks and novices give a new years blessing. On March 15th, 2019 the Sangha of Wat Pah Nanachat welcomed the Going Forth of Anagarika Asaf from Israel as novice. His new Pali name is Sāmanera Bhāvito. 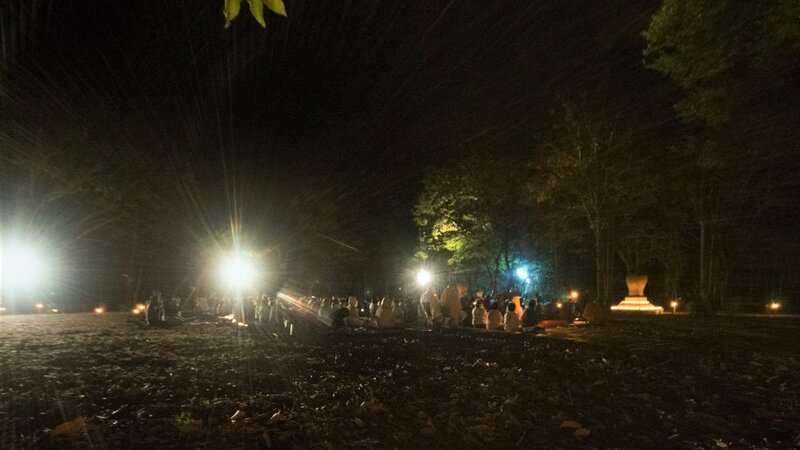 On Dec 31st, 2018 in the open area of Wat Pah Nanachat’s Sima-Stones ,the Sangha and lay-community of Wat Pah Nanachat gathered to do chanting together and practice silently, doing sitting and walking meditation into the new year 2019 (or 2562 Buddhist Era). Not only did these auspicious practises reach the hearts of many sentient beings, but they were meant to bless the site for beginning the construction of the new ordination hall (“Uposatha Hall” or “Bot”) of Wat Pah Nanachat in 2019. 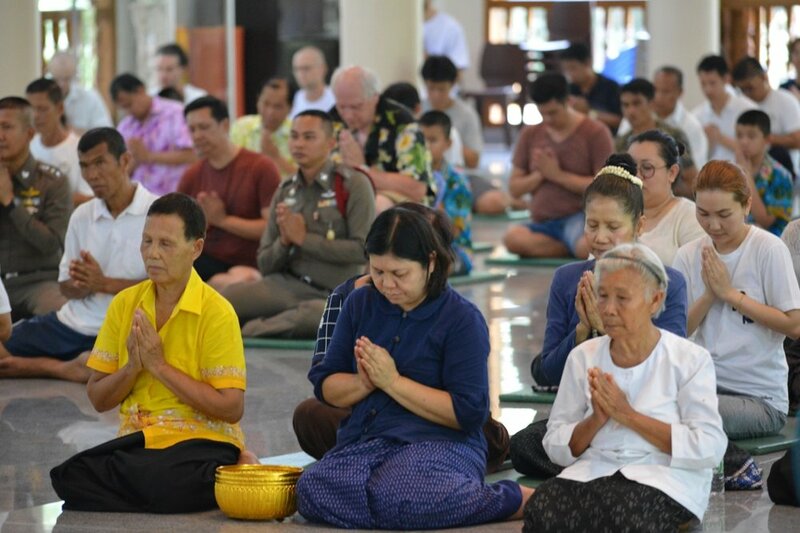 On the occasion of Ajahn Kevalis 50th Birthday, he and three monastic friends that also turned 50 in 2018 (Phrakhru Subbatapunnathada, Phrakhru Sangharak Sawaeng and Tan Ajahn Parivat) took the Sangha and the lay-community of Wat Pah Nanachat to pay respects, and meditate at Phra That Phanom Chedi in Nakhorn Phanom Province. Anagarika Jasper (New Zealand) and Anagarika Russel (Sweden) became Samaneras (novices) at Wat Pah Nanachat on the afternoon of October 19, 2018. On September 10, 2018 a group of monks, novices and anagarikas went on foot over to Wat Nong Pah Pong to take part in the monastic practice-week that Luang Por Liem offers to his disciples every year. The walk from Wat Pah Nanachat (Bung Wai Village) to Wat Nong Pah Pong (Bahn Gor/Bahn Glang Village) takes about an hour and a half. Before Wat Pah Nanachat was founded, Luang Por Liem and Luang Por Sumedho at times went on almsround in Bung Wai, coming from Wat Nong Pah Pong, as already then many of the Bung Wai villagers had great faith in Luang Por Chah and were practising regularly in Wat Nong Pah Pong. 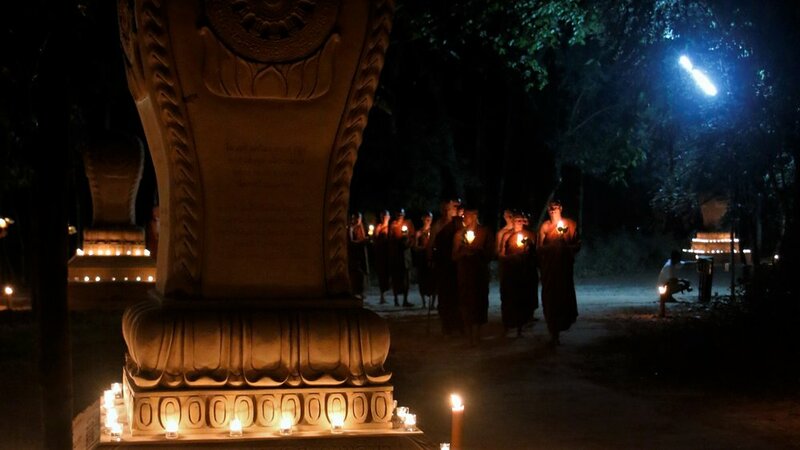 On September 3rd, 2018, the set of 80 volumes of the Sajjhaya Edition of the Pali Tipitaka - the Buddhist Pali Canon noted in a specific way that facilitates recitation and a precise pronunciation of the Pali language - were brought to Wat Pah Nanachat in a procession lead by the gouvernor of Ubon Rachathani with Phra Thepvarajahn, the head of the Ubon Sangha administration, presiding over the ceremony. On June 10th, 2018 Ajahn Kevali had the honour to receive the Royal offering of this Tipitaka in the name of of HM King Vajiralongkorn by HH Sangharaja in Wat Rajabopit, Bangkok. 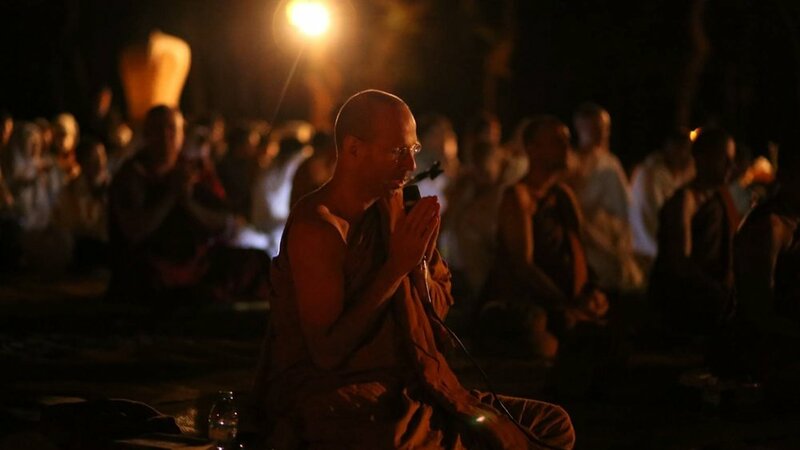 As it is tradition since the times of Ajahn Chah, the monks intending to spend the rains-retreat (pansah) together begin the retreat by paying homage to their teachers and the senior monks in the area. This year the sangha of Wat Pah Nanachat went to offer their respects to Ven. Thepvorajahn (head of the Ubon Sangha administration), Ven Seeratanobon (head of Warin district), Ven. Phrakhru Sudhhammaprasut (head of the Bung Wai-Sangha), Luang Por See Sirinyano (the most senior disciple of Ven Ajahn Chah, Wat Pah Sirimongkon), Luang Por Liem (the abbot of Wat Nong Pah Pong and preceptor to most of the Wat Pah Nanachat monks), Luang Por Chuh (Wat Wana Bodhinyan), Luang Por Vituhn (Wat Tham Saeng Phet), Luang Por Khun (Wat Pah Bhoseesuvann), Luang Por Anek (Wat Pah Sai Ngam) and Luang Por Damrong (Wat Pah Nam Kam Goeng). Wat Pah Nanachat hosted the temporary novice ordination program "truelittlemonk" from July 19 to 21st. Here are the links to the daily summary-videos. On June 10th, 2018 Wat Pah Nanachat had the honour to receive the royal gift of a set of the Pali Tipitaka printed by the World Tipitaka Foundation in a special notation facilitating the recitation of the scriptures. It was handed to Ajahn Kevali by HH 20th Sangharaja of Thailand, Somdet Ariyavamsakatanyan, at the temple of his residence, Wat Rajbopit in Bangkok. Visakha Puja is the full moon month of May, where Buddhists all over the world commemorate the day the Buddha's birth in Lumbini, his full awakening under the Bodhi tree in Bodhgaya, and the final giving up of his body aged 80 in Kusinara, the "parinibbana", the ending of his last life. 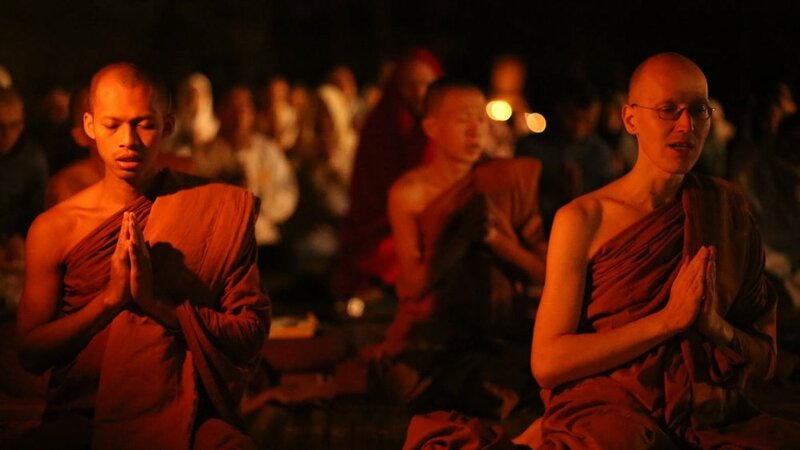 It has become an in-house tradition at Wat Pah Nanachat to spend the night of Visakha Puja meditating, chanting, and reading out key passages from the Pali Canon in Thai and in English, bringing to mind these three important events in the life of the Buddha. In 1975 Ajahn Chah established Wat Pah Nanachat (The International Forest Monastery) in order to give young men from foreign countries, who do not know Thai language and culture, the possibility of becoming a well trained Theravadin Buddhist forest monk. The first step to become a monk in Wat Pah Nanachat is to take on the homeless life committing oneself to the Eight Precepts as an "anagarika" (or "pakao", as anagarikas are called in Northeast Thailand), for about half a year. If the resident community feels it is appropriate, an anagarika can the request "pabbaja" - the "Going Forth" as a Buddhist novice, a "Samanera". In addition to the anagarika precepts, a Samenera renounces money and becomes an alms-mendicant, clad in the ochre robes of the Buddhist monastic order, the "Sangha". 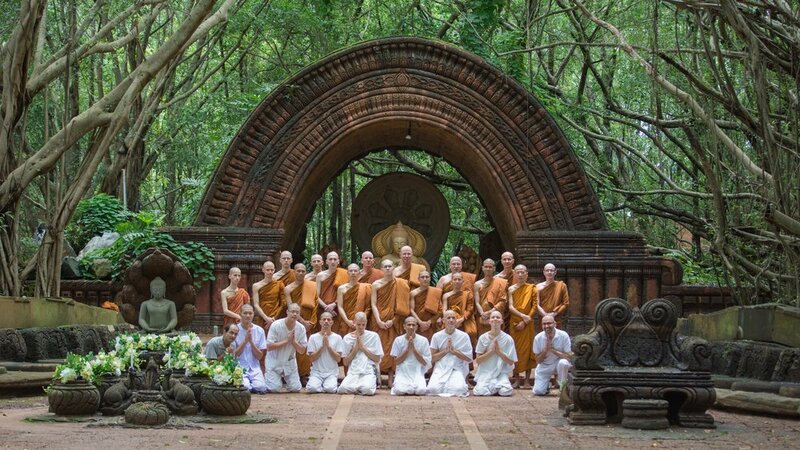 Since the beginning of Wat Pah Nanachat, monk and novice ordinations have always been conducted in Wat Nong Pah Pong, Ajahn Chah's main monastery. 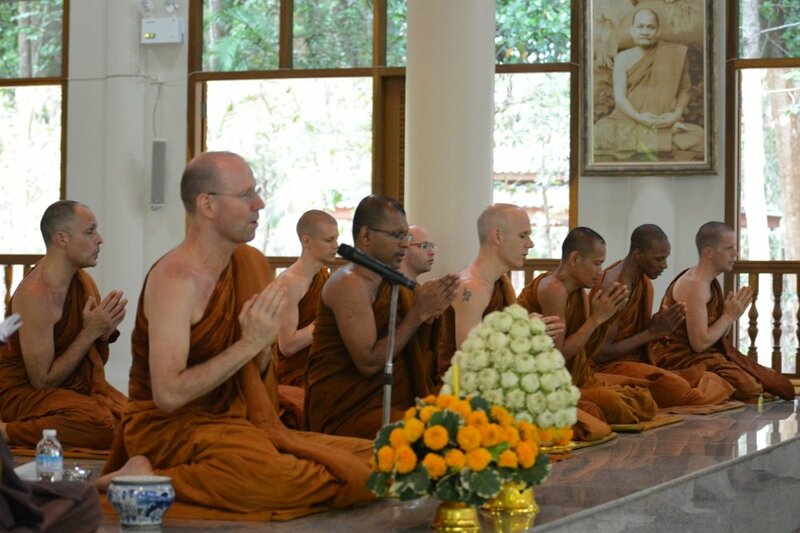 With Ajahn Kevali having been authorised to lead ordinations for the Wat Pah Nanachat Sangha since January 29, 2018, on April 3rd, 2018, this ceremony of "Going Forth" has been held for the first time at Wat Pah Nanachat. The picture shows the three Pakaos receiving the ochre robes from Ajahn Kevali. The Wat Nanachat Sangha preparing for "Pabbajja" - the "Going Forth" into becoming a Buddhist novice (Samanera). In the mother monastery Wat Nong Pah Pong this occasion is considered a rather intimate duty of the sangha, accepting and blessing a new community member. 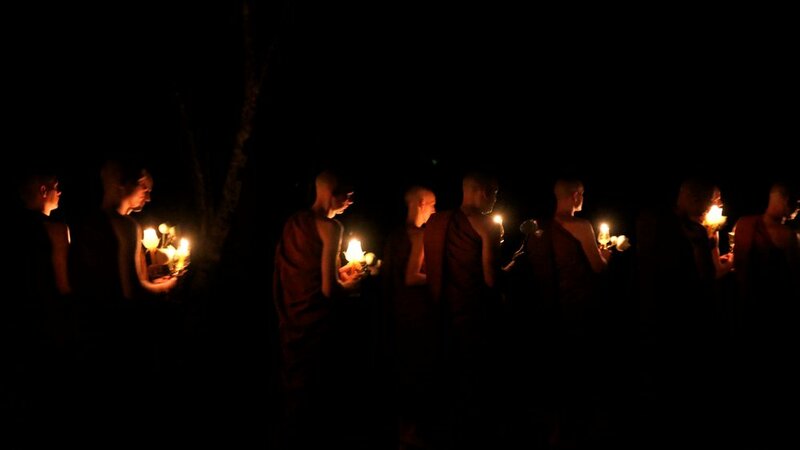 Thus the monks usually assemble early in the morning at 3:30 am, avoiding the traditional lay-celebrations, where many times the local villagers crowd the monastery in order to express their joy about a young man going forth with parades, music and dancing performances over many hours. For the foreign monks from countries from all over the world there usually wouldn't be many relatives or friends around and the good-bye from the world often already took place months ago when people initially left their homes and jobs for their new spiritual search heading for asia.